Matthew Fisher produced an album by then bass guitarist and singer of The Robin Trower Band, James Dewar. For various reasons, it was never released. Now, much as a result of efforts by Matthew's sister, Judith Fisher, this album has been released. This should be interesting to Procol Harum fans because of Dewar's Trower connection and because Matthew Fisher produced the album and even wrote some of the music. By kind help from Matthew, Judith gives more information on this album and the story behind it to the visitors of 'Beyond the Pale'. 'As you know, Matthew first met Robin Trower when they were in Procol Harum together, back in 1967. When Robin left PH to form his own trio, Matthew had already left to become an independent producer, and Rob asked Matthew to produce the Trower band's first three albums (Twice Removed from Yesterday, Bridge of Sighs and For Earth Below). Jimmy's rich and expressive singing blended perfectly with Robin's guitar, sounding raw and bluesy or warm and soulful as the material required, and the band became hugely successful, especially in America, with Robin and Jimmy co-writing much of the band's material. As a result of this success, Chrysalis commissioned Jimmy to record a solo album, which would contain material of a more mainstream / romantic kind, which was not suitable for inclusion on any of the Trower Band albums, and Jimmy asked Matthew to produce it. This worked out very well, because at that time Jimmy and his family were living just round the corner from Matthew, so the album was recorded in the relaxed and friendly surroundings of Matthew's home studio. The musicians on the album include: James Dewar, Matthew Fisher, Peter van Hooke and Bill Lordan, plus John Allair, David Hayes, John Platania and Dahoud Shar (from Van Morrison's Caledonian Express), and super session men Mo Foster and Dave Mattacks. The result is an attractive mixture of original songs (including one new Dewar / Trower composition and three Dewar / Fisher numbers) and a few old favourites by Buddy Holly, Lieber / Stoller and the Rolling Stones. Unfortunately, after that nothing happened, because Chrysalis never got around to releasing the album, so the tapes lay forgotten and neglected in their archives. Chrysalis is now under new management, and they recently got out the tapes of Jimmy's album, listened to it, and decided they liked it and wanted to release it as a tribute to him, as one of the major artistes who helped to build up the label in its early days. Matthew personally supervised the cutting of the CD master, and the sound quality is superb. The art department have come up trumps with some really good photos of Jimmy, and everyone at Chrysalis has taken a tremendous amount of care and trouble to ensure that this CD is superbly produced and presented. Naturally, Jimmy and his family are delighted to see this album released at long last, and the staff at Jimmy's hospital all like it, too. In fact, all the people who have heard it have enjoyed it, but everyone seems to have a different favourite track, so it seems there is something to appeal to all tastes. asking them to play it. One suggestion: Towards Christmas, perhaps people would like to send in radio requests for the track called Hosanna, because this was intended to be the 'Christmas single', and it could become a popular and seasonal anthem if enough people hear it! If you have ever listened to the original Stone the Crows or Robin Trower at his peak, then you've heard the voice of James Dewar. The Glasgow-born singer is one of a legion of great Scottish vocalists (including Frankie Miller, Tam White, Alan Ligertwood, Alan Gorrie and Hamish Stuart) who brought a soulful passion to their music. Dewar's career began in the early 60s. While still a teenager he sang and played bass in the Gleneagles alongside Alec Bell (guitar), Ross Nelson (guitar), Jimmy Smith (saxophone) and David Miller (drums). By 1963 they were the resident band at Glasgow's Lindella Ballroom but their fortunes changed dramatically one night when a diminutive girl vocalist got up to sing with them. Marie McDonald McLaughlin Lawrie was barely fifteen, but her confidence was overwhelming. She joined the group, which quickly took another name inspired by the new arrival, Lulu and the Luvvers. The realigned unit then moved across town to the hipper Le Phonograph, where they became regulars. The club was owned by Tony Gordon, who had commercial ties in London. By February 1964 he had secured a deal for the group with Decca, and the result was Shout, one of the definitive singles of the Beat era. It deservedly reached the UK top ten, but interest in the tiny singer with a fishwife's roar obscured the punch the Luvvers brought to the songs. As interest became increasingly focused on Lulu, the role of the group diminished. Session musicians were used on later recordings and, despite working on one-night stands and package tours, disaffected Luvvers began to drift away. Jimmy Dewar left in 1965, returning to Glasgow to rethink his career. By 1967 he could be found in a new band, Sock 'Em JB, an exciting unit fuelled on material by Otis Redding, Sam and Dave, and Wilson Pickett. The vocalist was ex-Del-Jack Frankie Miller and the pianist John McGinnis, formerly of the Blues Council. (The latter act was one of the finest Scotland produced, revolving around one-time Alex Harvey saxophonist Bill Patrick and Harvey's younger brother, Leslie. Sadly, two members were killed when their van crashed returning home to Glasgow from Edinburgh, and the despondent survivors split up.) Sock 'Em JB were together for only a matter of months, ending when Miller formed a new group, Westfarm Cottage, en route to the Stoics. Dewar and McGinnis remained together and, by the following year, had formed a new tough-sounding band, blending blues and progressive rock. They were preparing to be the resident act at a new club, the Burns Howff, when Leslie Harvey and Maggie Bell walked into a rehearsal. After a jam it was suggested they join forces and Power was born. With Bell on vocals and Harvey on guitar, the unit gelled perfectly and they quickly became one of Glasgow's most popular attractions. In 1969 Peter Grant, Led Zeppelin's manager, came to Glasgow to see them and within a matter of months they had won a management and recording deal. Renamed Stone the Crows – and with the addition of ex-John Mayall drummer Colin Allen – the group recorded two excellent albums, Stone the Crows and Ode to John Law. Bell's passionate voice and Leslie's fluid, economical style may have defined the band's music, but Dewar's role should not be underestimated. His playing was always sympathetic and his earthy duets with Bell were genuinely moving. 'He's one of the finest singers I've ever heard,' she said in a later interview. However, the axis of the band had moved – the singer and guitarist were also a couple – and both Dewar and McGinnis were unhappy with the diminished role they now played in the group they had formed. Both quit in February 1971. In September 1972, this is exactly what happened. A new group, dubbed 'Robin Trower', made its début in Vienna with a line-up completed by Dewar and drummer Reg Isadore. Two enthralling albums, Twice Removed From Yesterday and Bridge of Sighs, followed, on which Trower's searing but melodic guitar work was matched by Jimmy's soulful voice, fully free at last to express emotion and empathy. Another former Procol member, Matthew Fisher, produced both sets and the understanding he showed with Robin and the group was clear to hear. By 1974 Robin Trower were established on the US circuit and when ex-Sly Stone drummer Bill Lordan replaced Isadore, a more rhythmic texture came to the fore. 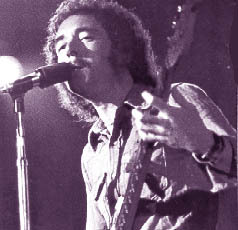 For Earth Below (1975), Live and Long Misty Days (both 1976) ensued before another ex-Sly member, Rusty Allen, took over on bass to allow Dewar to concentrate on vocals. In City Dreams (1977) and Caravan to Midnight (1978) were completed before Allen quit and the group reverted to a trio for Victims of the Fury (1980). This was the last Robin Trower album to feature Dewar. The guitarist and drummer formed a new band, BLT, with ex-Cream bassist Jack Bruce, while Jimmy gradually dropped out of professional music altogether. During the halcyon Robin Trower era, Dewar recorded this solo album, not released until now. Matthew Fisher was again on hand for the bulk of the recordings, producing and adding organ, piano and synthesisers. Other collaborators included Andy McMasters (ex-Motors), who wrote or co-wrote some of the material, John Platania and David Hayes from Van Morrison's Caledonia Soul Orchestra, and Fairport Convention drummer Dave Mattacks. The set includes three cover versions: the Rolling Stones favourite Out of Time (re-cut around the same time by fellow Scot Dan McCafferty), Buddy Holly's Heartbeat and the Drifters' Dance With Me, the last of which is beautifully understated. Indeed the entire selection is nicely restrained, a contrast to the sometimes turbulent sound of the Robin Trower band. The ease with which Jimmy tackles Lay Down the Night, Sands of Time, and the Christmas anthem Hosanna!, confirms his talent, but the undoubted highlights are the Dewar / Fisher composition Nature Child and the same team's title track. The mastery with which the singer approaches this melancholic piece is moving: warmth tinged with regret, and perfectly controlled – a self-portrait which sums up the poignant artistry of the whole collection. Stumbledown Romancer is, sadly, Jimmy Dewar's last record. He is currently hospitalised in Glasgow, struck by a progressive illness without cure. Hopefully, the release of this CD will prove a timely reminder of Jimmy's gifts, which have contributed so much to so many well-loved bands, and are here revealed for the first time in an intensely personal repertoire of his own choosing. Fans have complained that Stumbledown Romancer is difficult to find in the stores. Yet thanks to Joan May, BtP can now put you in touch with a source in Britain.